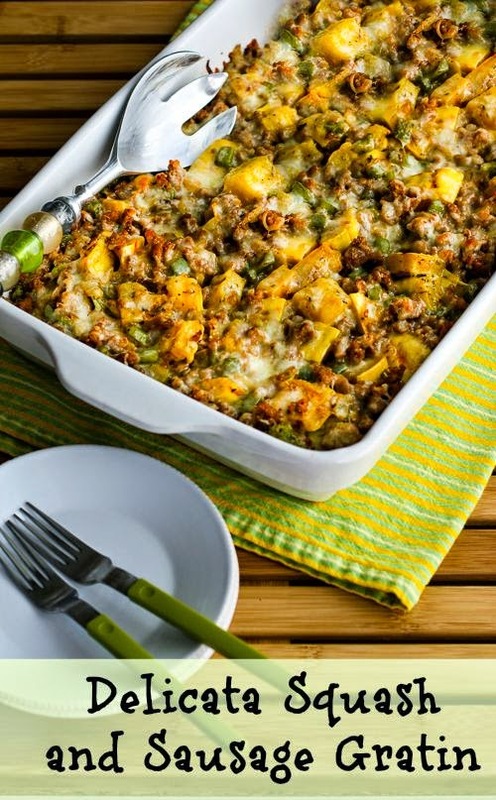 Delicata Squash and Sausage Gratin also has green bell pepper and cheese, and it's delicious. I'm developing an obsession with Delicata Squash, so forgive me for a minute while I rave on about this delicious user-friendly variety of squash. And if you're wondering how a squash can be user-friendly, it's because you can eat the skin of Delicata squash, unlike other winter squash varieties! How cool is that? I got so excited I almost typed it in all caps, which is a blogging no-no. Delicata Squash is also lower in carbs and higher in fiber than many types of winter squash. Best of all, it's absolutely delicious, and I love using it for an easier option when I'm too rushed to peel and cut up a butternut squash. I came up with this Delicata Squash and Sausage Gratin by default when my nephew Jake and I were trying a recipe idea with a sausage and green pepper mixture stuffed inside Delicata squash, and we ended up with far too much stuffing for the amount of squash we had. So we went to Plan B and made a casserole with the roasted squash, sausage-pepper mixture, and cheese. Jake isn't the biggest fan of winter squash but he agreed it was really, really good, and when my first photos weren't that great I made this again with my niece Kara who also loved it. If you like winter squash in general, I bet you'll love this recipe as much as we did!